Giggles echoed from the edge of the family room. The girls circled up, creating wonders with their Magic Looms, while the guys munched on chips and salsa at the kitchen table. Throughout our home, conversations erupted; the stories shared and memories made created our signature. As I stood back and watched, my heart swelled. In the last few months, hundreds of people have graced our floors, shared their stories, enjoyed our volleyball court and encountered just a bit of our bedlam. Birthdays celebrated, graduation commemorated, holidays remembered and just good ole fashion community occurred. “It’s such a huge change, and it really makes a difference in here,” she agreed. A home is not made by the floors that are laid. 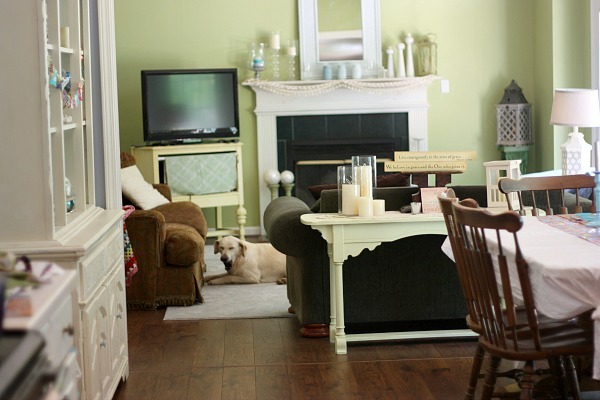 A home is not the paint color or the furniture choices. We can make a house a home without spending a dime, but there comes a time when investing in one’s house to help create the home that you imagine makes all the difference. If there’s one home decorating decision that I wish I would have tackled earlier, it would definitely be to have changed our flooring. I procrastinated for two years, and the difference it makes in the overall home appearance is SO dramatic! I love them as much now as the day they were installed. 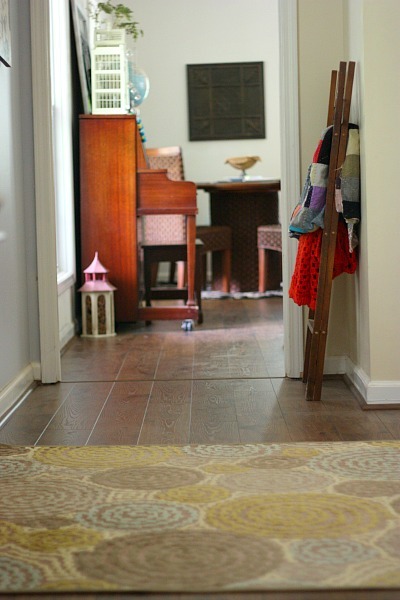 Since our home’s floor plan is quite open, the stately Mohawk laminate flooring sets the tone for the entire downstairs. Elegant and beautiful, they are an art form by themselves. Not a gathering goes by when someone doesn’t ask about them, bend down and touch them when I reveal they aren’t hardwood and then spend a few minutes expressing disbelief. 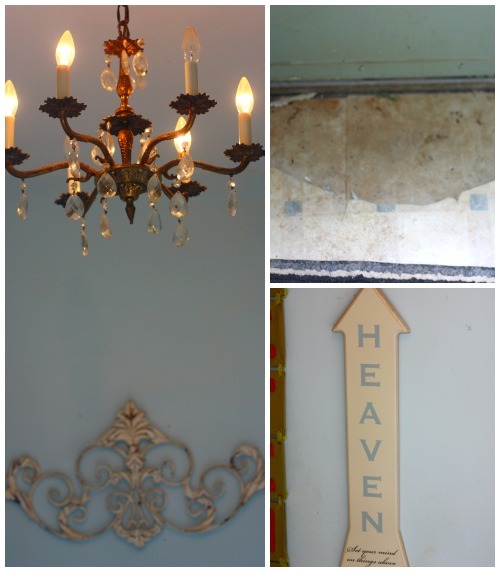 Let’s just reminisce and take a peek at the different rooms which I already featured. 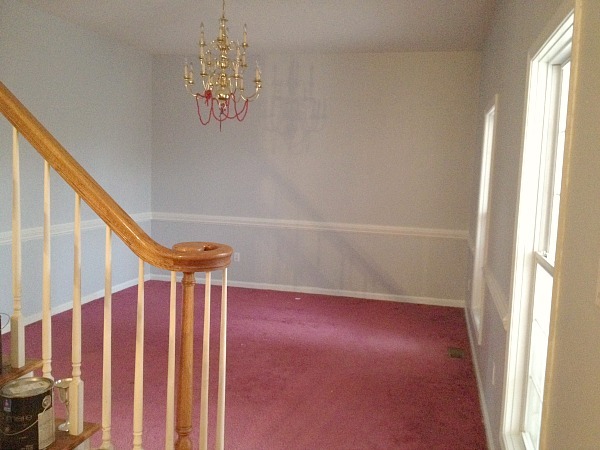 Yes, the Dining Room and the great purple carpet debacle is something we will never forget. The difference in here is remarkable. Our view from the kitchen. It’s magical in this light. The view from the kitchen into the great room. We can’t gather enough in this room. In the next year, we have lots of plans for this whole area. While the changes won’t be significant, the few we do will really make a difference. 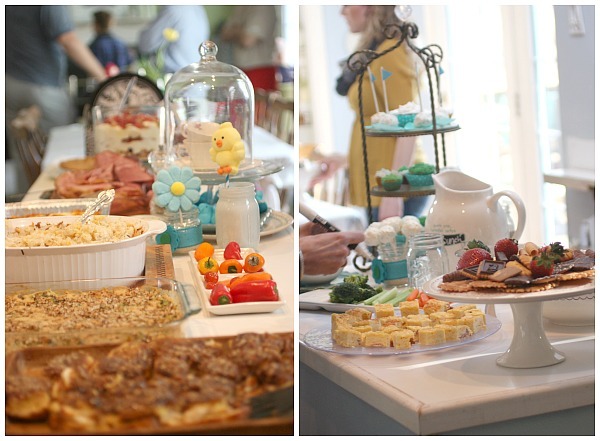 (See the entire kitchen post here and read about my spontaneous kitchen demo. There are so many rooms in our home that I haven’t ever shown and here’s a peek at a few of them with our new Mohawk floors. We’ll start with the main entry way. Let’s head to the left. I need to define this space but just haven’t figured it out yet. It’s long and skinny, with odd spaces on the two walls that plank the piano. I’ve contemplated turning it into a craft and office spot, but that’s only if I can keep it neat, and I’m not sure if that’s possible for a creative-type space. Yes, the before and after. I am so glad to have that white carpet gone. This table set is one of my most fun finds, which I purchased through a silent auction for only $100. If I end up turning this room into an office/craft room, this great table will need to find a spot upstairs. 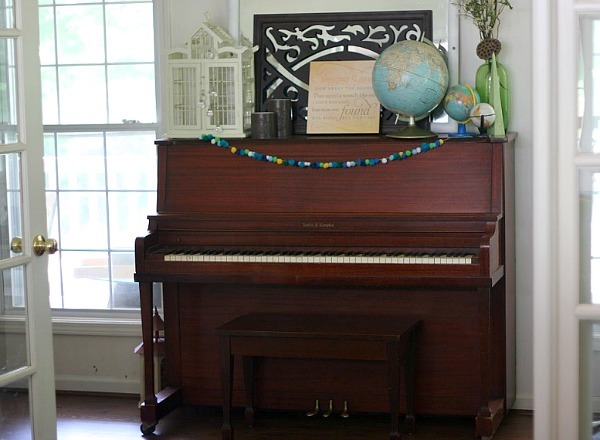 I can’t wait to paint our free to me piano, but that comes after I paint our kitchen table. Can you tell I have lots of painting plans ahead? Here’s just a glimpse of the laundry room. Do you see how bad the floors were in there? The laundry room had the most wear and tear on our flooring. I tried to just keep covering it up, but it ripped further and further. It gets the most abuse by far, so I’m thrilled that the laminate is holding up to its guarantee. During the cold months, all three yellow labs were gated in here, and one would never know. There are no scratch marks at all. I will be showing the laundry room in a future post because I did a fun redo on my bookshelves which demands its own page. 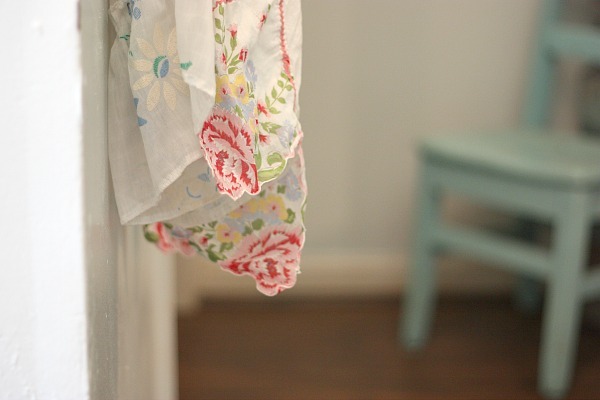 I still have my favorite pretty aprons collection hanging on the wall, and each time I see them I pretend I live in a different era where everyone loves aprons like I do. 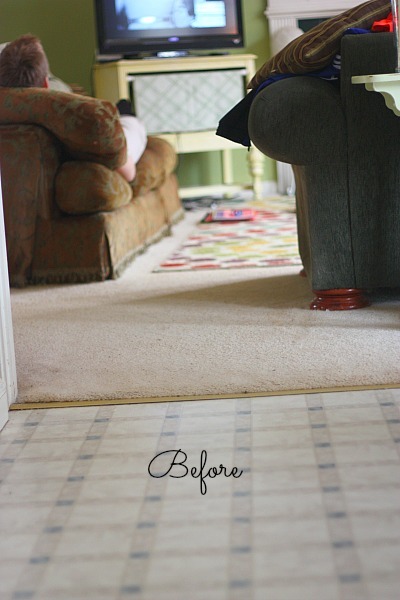 There are still so many projects that we’ve just touched the surface on in our home, and the change that our floors gave our home have given me the DIY bug. I am so grateful for the opportunity to begin focusing on renovations. I’ve had so many other obligations that I’ve finally stepped down from, so it’s the first time in years I’ve had the chance, and I’m hoping my daughters catch the DIY bug right along with me. If you are thinking about adding new flooring to your home, I highly encourage your to find your nearest Mohawk retailer here. After so much research, I am just thrilled with ours. 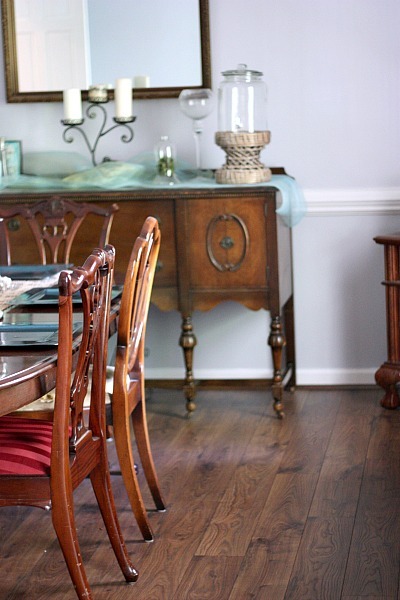 Also, don’t forget to read my Tips for Picking Out New Flooring. I share my pros and cons from my months of research. What are your indoor home goals for the rest of the year? Now it’s your turn. I’d love to hear. Sometimes it’s just fun to state them and then shoot for it. 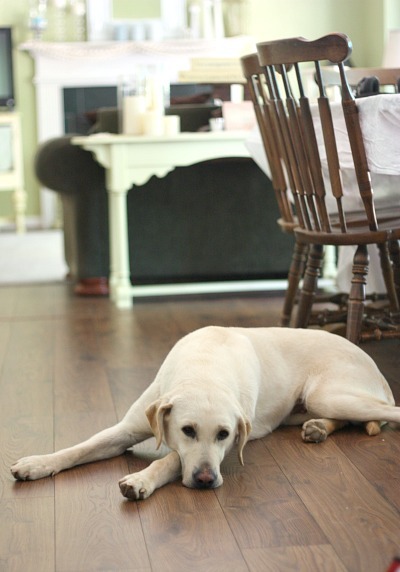 Disclosure: It’s been a delight to partner with Mohawk on our laminate flooring projects. While we paid for all the labor and installation, they provided the laminate in which we’ve fallen in love. It’s just beautiful. YES! Something we’re learning this year with our own home improvements. The wait was worth it!! 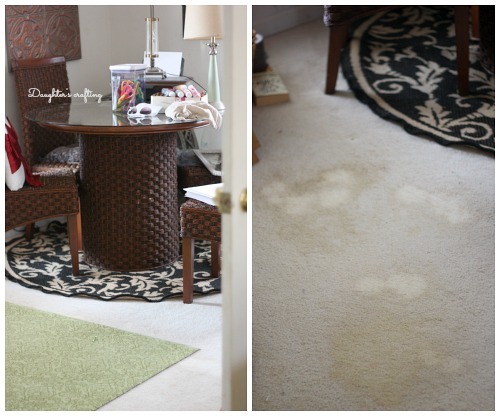 I so wish we could change out all our old carpet for solid surface! 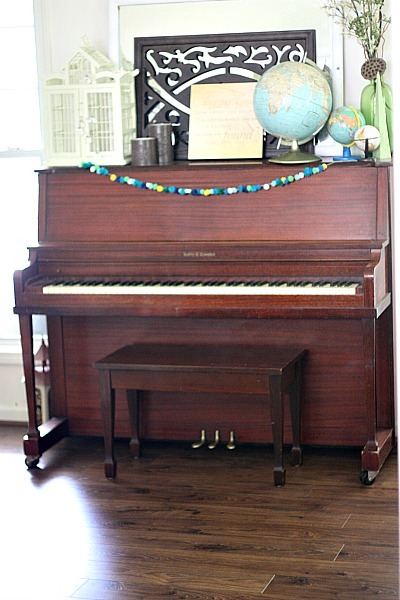 I vote you rename your sitting room “conservatory” in honor of the piano. 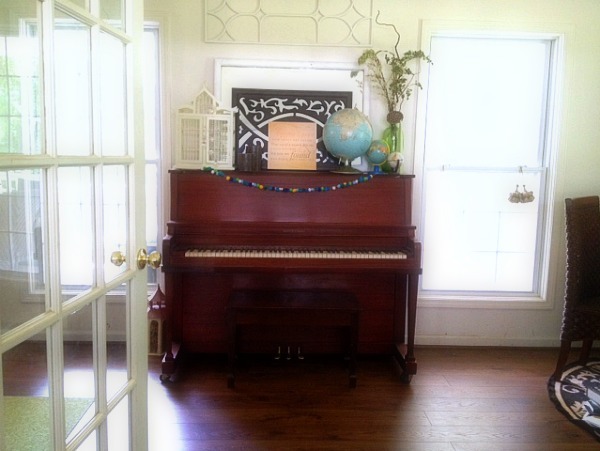 As a family with a relatively small house and probably too many musical instruments (including a piano) I am officially jealous of someone with a potential music room. HGTV Magazine had something this month about how to paint a piano (i.e. make the paint stick and protect the works inside), if you can get your hands on a copy. 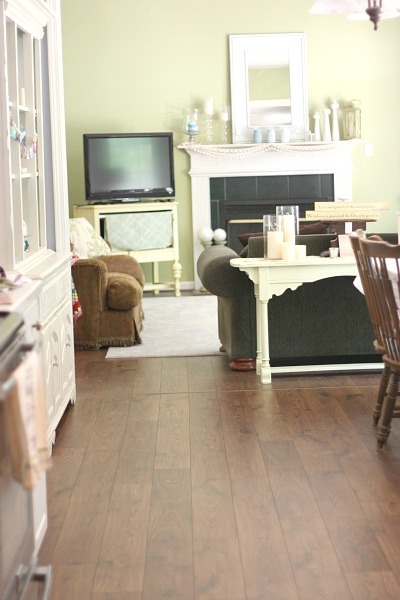 Jen, your floors are just gorgeous! My inside home goals for the rest of this year are to repaint my dining room, get a set of 12 cross stitch pieces by my mama framed, and turn the upstairs bonus room into a “boy cave”. Thanks for the inspiration! 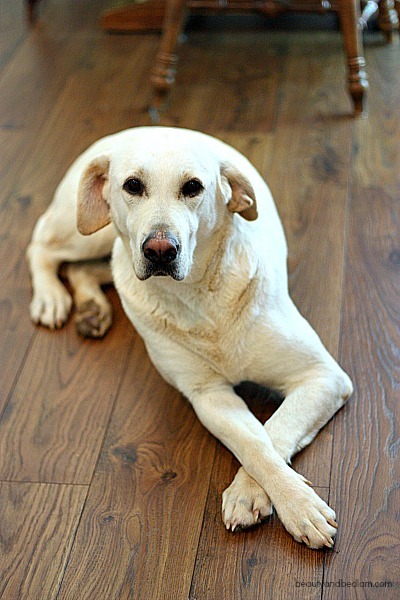 I love your new floors. They look great! Home repair and improvements take time. Most people can’t do them all at once. Your before and afters are great because most of us have rooms like that. Thanks for keeping it real! We are having a lot of work done at our home, hopefully to sell it and move out of CT because it is too expensive here. Anyway my husband and last son here just took the 3 bedrooms down to the studs upstairs and when we spoke to our contractor he said there were a lot of laminates around that were beautiful which my husband and son doubted. I showed both of them this blog and I think they were shocked. We will also refer back to your tips and also go on the Mohawk website. We have quite a bit of work to do before we are at that point but I can see the light at the end of the tunnel. Thank you for all of your information!!!! WOW, three bedrooms down to the studs? That is amazing. I am so glad the photos were helpful. 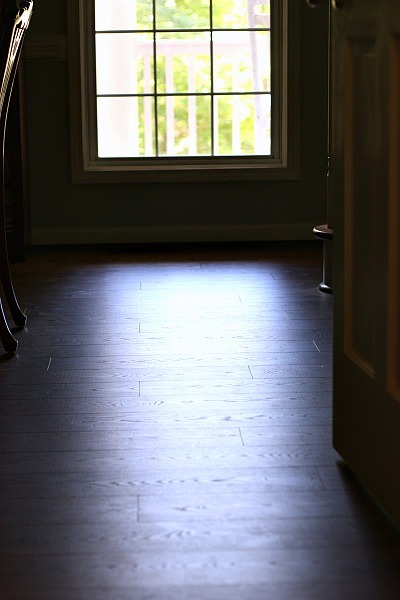 Honestly, the floors look even better in real life and for resale value, a quality laminate is a great way to go because they look like hard wood, but don’t carry the high cost. Cheering you along with all your renovations. I’d love to see some before/after pics when you get closer. 🙂 I bet it will be amazing. So glad you posted more pictures of your floors. I was just thinking about them the other day and wondering specifically if you were still happy with them and if the dog ever came around to walking on them. Since she’s in the pictures, I’m assuming she (he) has. Have her nails caused any damage to the floor? Does she more of an indoor or outdoor dog? I’m looking to replace our flooring, but have a large indoor dog and have been on the fence on hardwood vs laminate. They look great in the pictures. 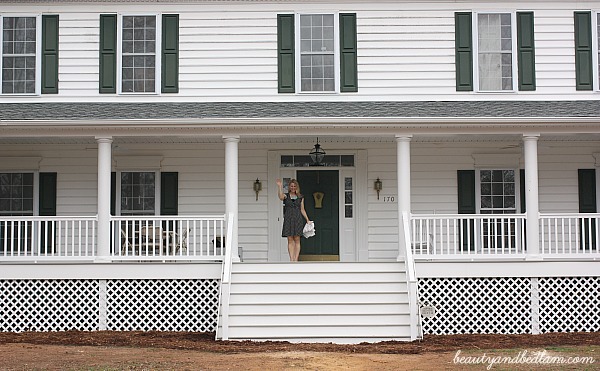 Love, love, LOVE the front porch! The floors are just beautiful. I adore your porch. The puppy is gorgeous, too! 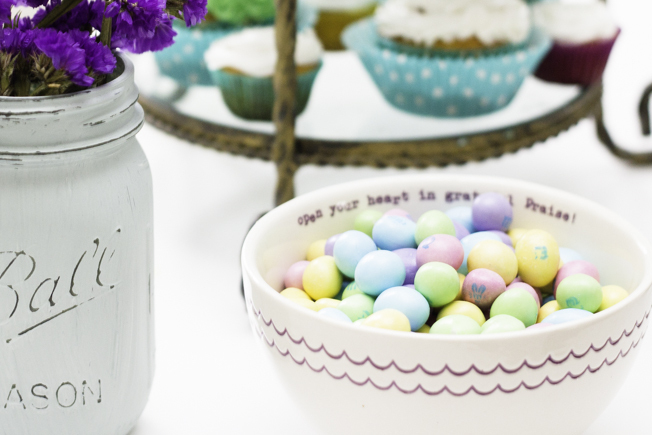 You are so right about having gatherings more often. 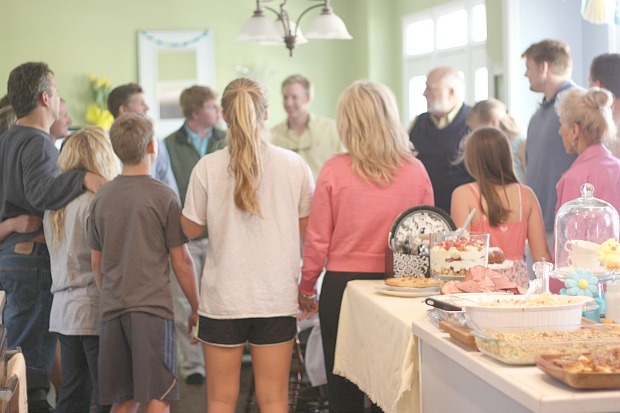 There is something wonderful about opening your home, sharing a meal, and making memories with friends and family. 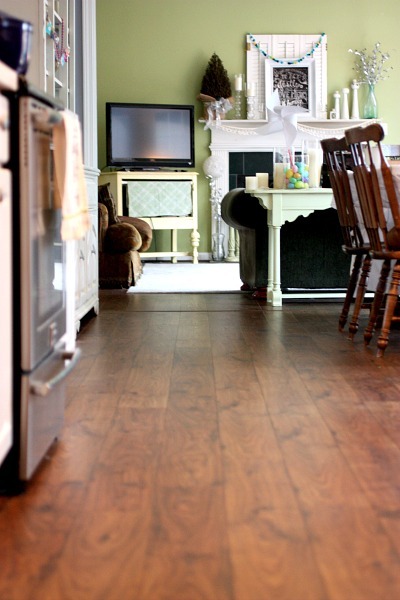 I hope to one day have flooring like this replace my cracking linoleum, my stretched out carpet, and my cracked tile. (I don’t mean to sound as though I am complaining at all!) 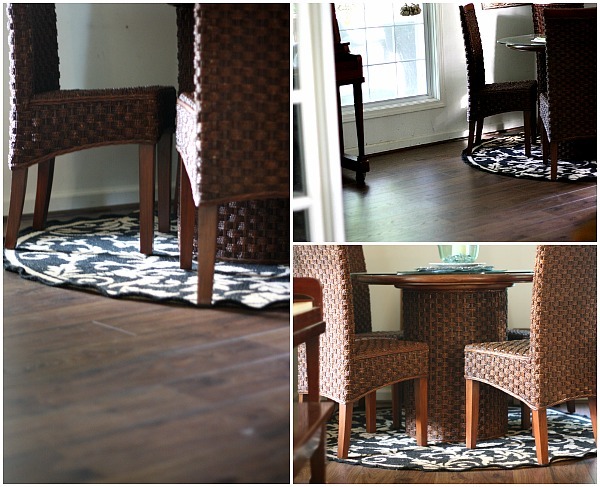 I will definitely consider Mohawk laminate after seeing your photos! Thank you. 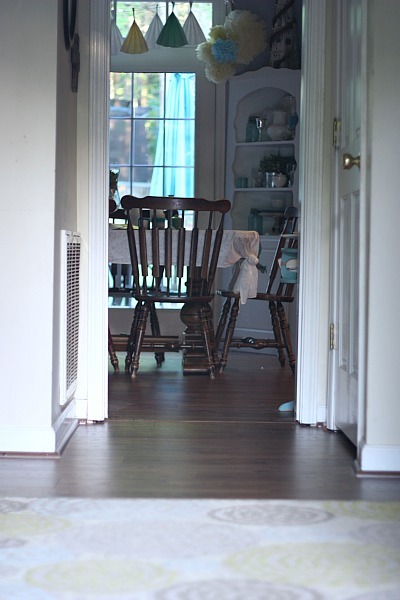 I am in the process of thinking of changing our kitchen and great room flooring. You have helped me so much with this decision. I may email you as my time gets closer. Thanks so much. Yes, please feel free. There are so many good choices out there.